We added the Vitality Facial Cleanser to compliment our Nørdik line of Vitality Detox products formulated to detox and aid in healing the skin. This facial cleanser is a good product to use with the Vitality Detox Bar Soap and Vitality Detox Hand and Body Moisturizer. This is our line of premium Scandinavian derived organic bath and body products. They were formulated using mostly sourced Scandinavian ingredients. They were all given product names of Nordic origins. They contain pure therapeutic grade essential oils (most are organic). 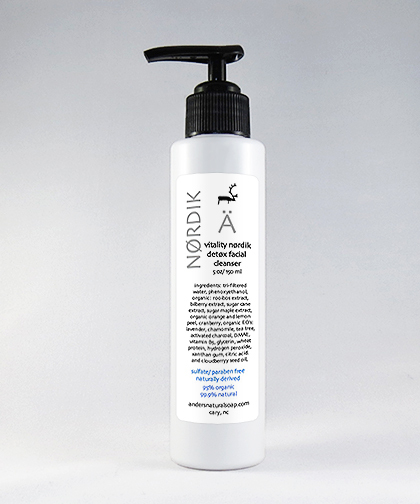 Our Nørdik Vitality Detox Facial Cleanser was formulated to compliment our bar soap and hand and body moisturizer bearing the same name. We add a synergistic blend of organic essential oils to aid in the detoxing process. We are very proud of this line offering as Mike&apos;s grandparents emigrated from Scandinavia; his grandfather from Finland and his grandmother from Sweden. Our facial cleanser is packaged in a white PET bottle with a black pump and a rectangular label attached. Fruit extracts are high in polyphenols that fight free radical damage of the skin. Known for its calming effect, this oil distilled from the Chamomile flower has anti-inflammatory properties that benefit the skin. Studies have shown that Chamomile essential oil has antioxidant and antibacterial properties. Chamomile has been used for centuries for its soothing abilities. Tones and tightens skin and aids in the removal of wrinkles. It is especially effective for mature skin.